Epic! calls itself the first “All-You-Can-Read” eBook service for kids. It currently offers thousands of digital titles from 40 publishing partners, including HarperCollins, Simon & Schuster, National Geographic, Kids Can Press, Blue Apple Books. The growing digital collection of titles for ages 2 through 12 includes many recent and award-winning books and represents a mix of fiction and nonfiction. New titles are added each week. Among the popular fiction and series titles available are: Olivia, Cloudy with a Chance of Meatballs, The Berenstain Bears, The Chronicles of Narnia, Ramona, A Series of Unfortunate Events, Flat Stanley, Scaredy Squirrel and Big Nate. There’s a wealth of high quality attractive nonfiction and graphic novels as well. I chatted with Suren Markosian, founder and CEO, whose earlier projects included the social gaming platform, CrowdStar for Facebook and mobile devices, and with co-founder, Kevin Donahue, former YouTube, Google and Disney executive. We built a lot of games and realized how accessible games are. I watched my son play all the games he wanted, but he couldn’t just go and read any book he wanted. Games and videos were a tap away. Books were not. As a a parent, I had to buy each individual book for my son. There was a wall between kids and books. So we put our skill set to it and we started with the consumer market, because we understand it and because we are parents. We wanted to provide a digital library from a child’s perspective. We wanted kids to have access to a large collection of books–to be able to see all the books. Books are suggested to children based on what what we know about them and the service gets better as it gets to better know better the reader. We built the app with engagement in mind. 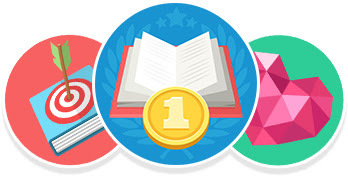 We reward kids’ reading with badges. The goal is to provide a wide variety of high-quality titles from award-winning authors that complement the curriculum and encourage a child’s love of reading. The consumer product is kind of Netflix for picture books, with an unlimited library of content, instantly streamed, available on a monthly basis, following a 30-day free trial. Books are vetted by a team of publishing professionals, educators and children’s literature specialists, as well as a Newbery Award-winning author. Users can search for titles or browse the collection by book category: picture books, chapter books, early readers, fact books, or comic books and filter by age groups: 4 & under, 5-7, 8-10, 11-12. 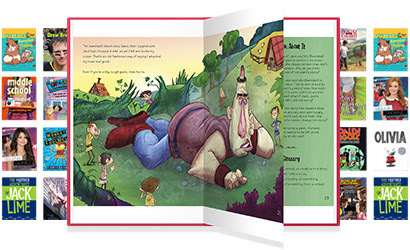 Books stream and deliver to the iPad in an instantaneous fashion, caching data on the device. You simply click on a book and read it or hear it. Books may be completely downloaded for use offline when no wireless is available. Once downloaded, the book stays on your device. In the consumer version, children set up a profile, customize the site, create reading logs, rate and favorite titles, and unlock reading badges. Subscribers may create multiple profiles, so that a parent might create individual reading profiles for up to four child readers. No personally identifiable information is collected. While Epic! is primarily geared (and reasonably priced) for home use, its founders see offering the service to educators as a win/win. Suren noted that the team received many requests from teachers. Of course, we recognized them as core influencers. We realized that by helping educators, not only could we get our product out there, we could also do something good. We want this to be a great product for librarians and teachers and we think there is great benefit to using it in schools. We hope that in sharing with teachers we will discover what educators are looking for. We welcome feedback and recommendations. “check out” books without spending any money before deciding to purchase for a classroom or school library’s print collection. enjoy an ever-growing digital library with thousands of picture books, chapter books, early readers, nonfiction books and graphic novels completely (and always) free of charge. Important: Classroom teachers and school librarians may take advantage of the free offer by first registering on the Epic! for Educators website and entering their school credentials. Following this website registration, teachers will get a username and password. They should go to the app store and download the app. Note: If you don’t get your credentials first, you will automatically get the 30-day free consumer trial. The app is currently available for iPad only. An iPhone app will be available in early November and an Android app should be available in December. The team hopes to grow its personalized discovery engine around human-curated decisions as well as its algorithm. Kevin is hoping for more author interaction: Publishers are looking for ways to get their ebooks out there. We speak to the authors all the time and they are thrilled that kids are finding their books. We hope to create more engagement by providing authors a way to interact with kids. The way I see it, our use of Epic! for Educators will help build the market for a worthy app. The way I see it is we are on the same team and this gift presents a win/win. I can absolutely imagine this app inspiring shared reading experiences on screens and whiteboards in classrooms and school libraries. It will also help us discover new titles and promote discovery of our own physical and ebook collections. I just kinda wish this endorsement didn’t appear in their marketing and that I could convince Cool Mom Tech that her kiddos’ librarians will add significant value to their reading experience. Cool Mom Tech: If your kid is an avid reader—as in, he finishes his library books before he even gets them home from school—you may want to check out the “Epic!” app, a new eBook subscription for kids in one handy app that that offers all-you-can-read selections for a low monthly fee. No purchasing book after book. And no overdue fees from the library. I signed up as an educator, but every time I go to the site, it states that the first month is free but that I will have to pay $4.99 a month after that. I am thrilled to have come across your blog and this post in particular! I have just begun my first year as an elementary school teacher-librarian. Although I am new to this particular position, I spent 6 years as a general education classroom teacher. I have struggled with building an intrinsic love of reading within my students. I have learned that there is just something magical about an eBook. Whenever I pull out the iPads for guided reading, students immediately become more engaged and seem to feel more connected to the text. As far as eBooks go, I got by last year with our school’s subscription to ReadingA-Z. I by no means want to talk ill of that particular company because they provide a wonderful set of leveled readers. However, I could not help but think that the students were missing out on authentic literature. The Epic! app seems like a wonderful solution to this problem. I am so happy that the creators have decided to give teacher’s free access to this streaming content. As you mentioned, I can immediately see how I can use this for shared reading in my K-2 classes. I have already begun to skim through the collection and have made note of the eBook/eBook authors that we physically have in our school library. I can use the app to expose students to some of our physical collection items, and I am sure that those books will be flying off of the shelves. I also think it is important for our students to see their teachers engaging in the latest technologies. We strive to teach our students 21st century skills, which includes staying abreast to the latest and greatest. Using the Epic! app, we can lead/teach by example.